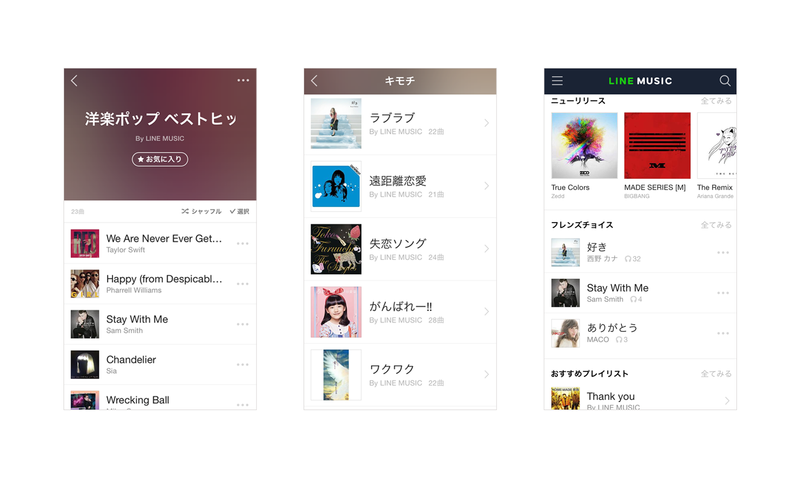 Tokyo, Japan – June 11, 2015 – LINE Corporation, owner and operator of the free call and messaging app LINE, today announced the official launch of the on-demand music subscription service “LINE MUSIC,” for Android and iPhone devices. 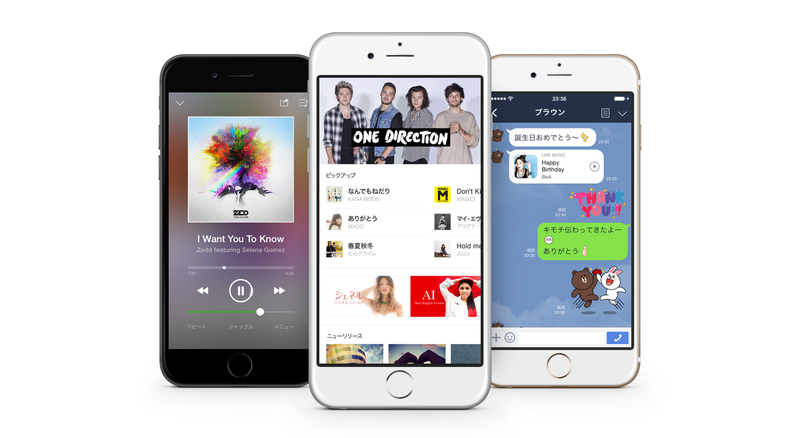 LINE MUSIC is an on-demand music subscription service, differing from the mainly prevalent radio-style subscription services currently found in Japan. With LINE MUSIC, users have the freedom to listen to the songs and artists of their choice, whenever and wherever they are. They can also create playlists of their favorite music. The first wave of music to join the launch includes Japanese music, Western music, K-pop, anime music, Vocaloid and more. The service offers over 1.5 million songs, including music from top artists Kana Nishino, Sandaime J Soul Brothers, and Che'Nelle. Additionally, the service boasts a wide variety of pre-made playlists, rankings, and more, offering users a multitude of ways to discover new music. What sets LINE MUSIC apart from similar services is its tight integration with the LINE messenger app. Users can effortlessly send music or playlists directly to friends or groups on the LINE app’s chat screen＊1, or share them on their Timeline. Songs sent by users in the LINE app can be played inside the app’s chat and Timeline screens, offering a revolutionary way to enjoy music as a social experience. ＊1： Requires LINE version 5.0.0 or higher. LINE is also continuing to launch official LINE accounts for artists with music on LINE MUSIC.＊2 Artists who have official accounts can add links to their LINE MUSIC artist page, stream music from their official accounts, post music playlists and more. By artists linking their LINE MUSIC and official accounts, users will be able to broaden their encounters with new music and artists. ＊2： 102 artist will have official LINE accounts upon the launch of service. A browser version of the service is planned for release in July in order to allow users even more versatile access to LINE MUSIC content. With the release of the browser version of LINE MUSIC, users will be able to enjoy their content from both their mobile devices and their PCs. LINE MUSIC plans to continue to expand its music catalog in the future, as well as offer users various promotions. With the concept "Ongaku wo LINE suru,” the service strives to go beyond being a music listening platform where users only listen to music they already like, and instead offer a platform that allows users to discover new songs and artists as well as enjoy their favorite tunes. With the launch of LINE MUSIC, we have realized our goal of creating a service through which this generation’s users can discover and enjoy music in a novel way. In particular, the service’s JPY 500 basic plan and student discount will offer younger users who have not yet used this type of music service a way to discover new artists and even entire genres of music, sparking a chorus of conversations along the way. We have plans to actively increase the number of songs, labels, and artists on LINE MUSIC in the future, and hope we can raise our users’ interest in music and revitalize the music industry in an effort to become the top music streaming service available. LINE MUSIC users are not limited to sending songs or playlists from the app to their friends and Timeline in the LINE app, but can also send them right from the LINE app chat screen to friends and groups. Songs sent on LINE can be played back in full without having to open the LINE MUSIC app, allowing close friends to listen to songs together while chatting, a group to play happy birthday for a group member while sending them congratulatory messages, and more, offering users a way to share and enjoy music together in real time. Even users without a LINE MUSIC subscription can listen to 30 seconds of LINE MUSIC songs, and use the sharing feature without any restrictions. ＊5： Friend’s Choice shows an aggregate of listening trends among the user’s friends, and does not identify what individual users listen to. The first wave of music to join LINE MUSIC tops 1.5 million songs which include J-POP, Western music, Vocaloid, and many more genres from 28 major labels and production studios. LINE MUSIC’s library features both popular hits and new releases, with artists such as Kana Nishino, Sandaime J Soul Brothers, Tsuyoshi Nagabuchi, Ayumi Hamasaki, UVERworld, Che'Nelle, BIGBANG, Sam Smith, Taylor Swift, and Michael Jackson. Plans are in place to form partnerships with more Japanese labels, artists, and indie bands, with the goal of expanding LINE MUSIC’s library to 5 million songs by the end of this year. In 2016, LINE MUSIC expects to add music from all over the world, increasing its library to over 30 million songs. ＊：Music will continue to be added to LINE MUSIC after the service has started. Subscription tickets for LINE MUSIC can be purchased from within the app or from LINE STORE (https://store.line.me). This feature is planned to be implemented by mid-July. Subscription plans are valid for 30 days and range from the basic plan, which allows 20 hours of streaming music for JPY 500 (Android/LINE STORE) to the premium plan, which offers unlimited listening over the same period for JPY 1,000 (Android/LINE STORE) or JPY 1,080 (iOS).＊6 Basic plan users can also purchase tickets for 10 additional hours of listening for JPY 300. All plans have discounts for student users＊7, allowing them access to the basic plan for JPY 300, and the premium plan for JPY 600. ＊6： Prices are set based on each app store’s regulations. ＊7： Eligible users must register their school name in the settings screen. LINE STORE is a browser-based online shop which sells LINE stickers, paid items for LINE games, and more. Users can purchase items on LINE STORE using a credit card, mobile phone payment through their carrier, or prepaid cards sold at convenience stores. ＊8： Users can enable or disable the cache and adjust its bitrate. ＊9： Users must be online to play songs in their cache in order to verify their subscription plan. Android and Google Play are registered trademarks of Google Inc. iPhone, iTunes, and App Store are registered trademarks of Apple Inc., registered in the U.S. and other countries. All other trademarks are the property of their respective owners. All information is true and accurate at the time of publication, and subject to change without notice.